Claiming he is fulfilling his promise to make government more efficient, Donald Trump today signed an Executive Order he says will “kill two birds with one stone” by reinstating waterboarding. 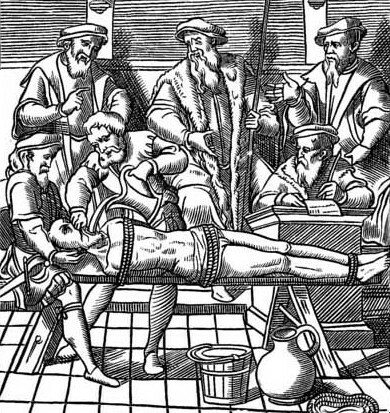 The Water Torture: Facsimile of a portion of a woodcut in J. Damhoudère’s Praxis Rerum Criminalium, Antwerp, 1556. “Are you saying the end justifies the means?” queried the Chair of the Ethics Committee sheepishly. “Of course, isn’t that what we were all taught as children?” Trump replied. The room grew silent as Trump smiled for the photo op. Sean Spicer then asked the Press to follow him for a short follow-up briefing. Appearing somewhat nervous and ashen, he gave further details regarding the Executive Order. Sean Spicer then passed out an “Alternative Facts” worksheet, which the White House will provide to them on a daily basis. Mr. Spicer looked surprised when he asked for questions and no one raised their hands.